Are you based in Ethiopia? Interested in some regular training? Have fun! Join our regular weekend group run-hike (7am every Saturday). Sociable, weekend morning jogging at a gentle pace, duration 40-60mins. Don’t want to run? Hikers and novices also catered for. 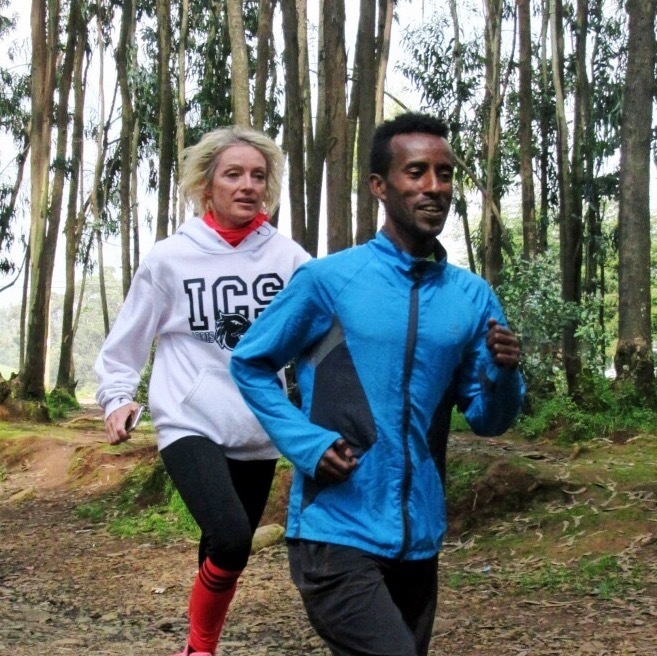 Discover new routes, landscapes and running lore in and around Addis Ababa. Camaraderie is a powerful motivator! Meet other fitness enthusiasts. Learn dynamic stretches, exercises, tips and improved running form from your Run Africa elite athlete trainer, as from your fellow runners. Improve your fitness! Take a one-to-one customised training package. A customised programme of one-to-one training with a personal Run Africa trainer, tailored to fit your schedule, aspirations and ability. Build your fitness, improve running form and learn dynamic warm-down stretches and nutritional advice. Discover new training routes of varying altitude, terrain and gradient, rubbing shoulders with world-class athletes at the sites that have produced generations of Olympic champions. Experience real Ethiopian athletics club training! Join Run Africa AC sessions (Tues-Thurs-Sat). Run Africa AC is the only registered Ethiopian athletics club with integrated inclusion of non-professional athletes. Discover new routes, as well as experiencing and benefiting from authentic Ethiopian club training. Meet the club on site or board the club bus; sessions on Tuesday, Thursday and Saturday mornings. Your personal athlete trainer will accompany you to club sessions. You will take part in the training and will not be left behind. Our training blocks of 6, 8 or 12 sessions per programme are customised to suit your availability and weekly time schedule. 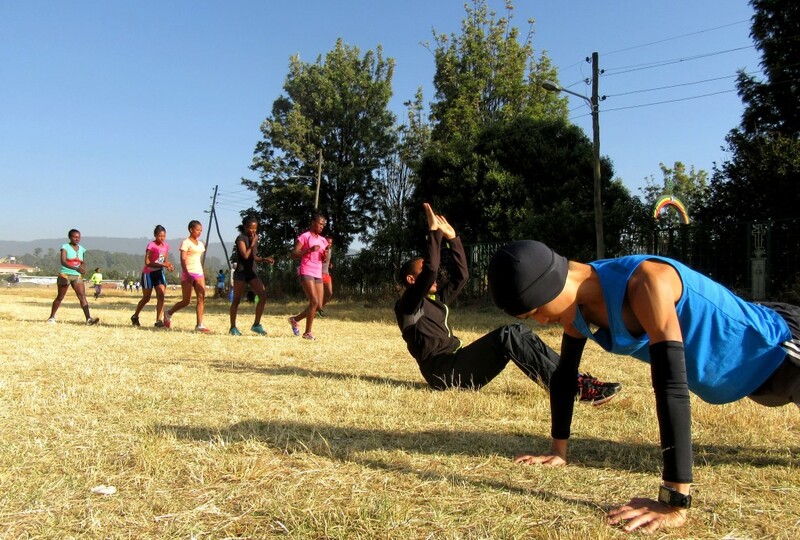 They also incorporate any training content, specific race goals that you have and / or sessions with Run Africa AC (Tues-Thurs-Sat) and / or weekly group runs. It’s your choice. Contact us and we’ll help you put together a programme to suit you. We welcome all abilities, from novices to experienced runners: there is no expectation whatsoever of minimum experience or ability. ችግር የለም፦ Chiggir yillem! Our pricing is structured so that the more sessions you book, the more economical it is for you. • *A scheduled programme of training with a Run Africa elite athlete trainer, customised to suit your availability, schedule, fitness level and aspirations. This can include sessions with Run Africa Athletics Club if desired. • Duration and intensity of sessions are flexible to your adaptation and feeling. • Our Ethiopia-based clients usually use their own vehicle, collecting the athlete trainer from a convenient location en route to each session. • If you are keen to run between your scheduled sessions, please let us know. Gentle recovery runs can be very beneficial, but must be done with some patience and care so as to ensure that you are maximising recovery rather than risking fatigue or over training. • Want massage? We’ll set you up with our experienced sports masseur, who charges very reasonable rates. • By using Run Africa’s services you are contributing to our athletes’ future! Learn more on our social contribution page. A memorable meeting for Melissa and Margot.